After our busy morning, we continued on to our afternoon visit with Turner Construction. On the afternoon of March 20th, 2017, we found ourselves at the site of the reconstructed Wilshire Grand Hotel! It was absolutely unbelievable to be invited to tour this groundbreaking, skyscraping, highrise mega-project. 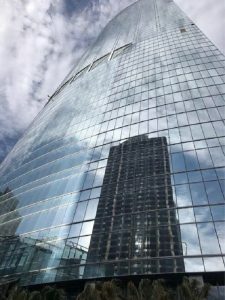 As the new tallest building in the United States west of the Mississippi River, the renderings nearly match the actual look of the building as the project nears completion. The grand opening is scheduled for June 9th, 2017, which will be approximately four and a half years after Turner Construction broke ground. 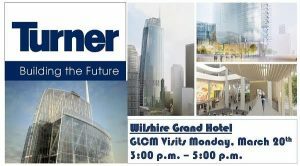 It all started with the demolition of the existing, less grand, 1.2 million SF old Wilshire Grand Hotel. Because of the close corridors of downtown Los Angeles, the demolition process took many months to complete in order to ensure the safety of both pedestrians and the jobsite. It was tough to believe, but no explosions were used in the demolition of the old Wilshire Grand Hotel. Ten months later and Turner had an empty site, ready to begin new vertical construction. 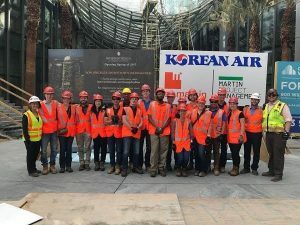 Since then, the team has worked at putting together an integrated project delivery for the joint owners: Hanjin International Corp&Korean Air Lines Co., Ltd. From the start, the design and construction team was composed of general contractor Turner Construction, architect A.C. Martin, structural engineer Thornton Tomasetti and Martin Project Management, to name a few. 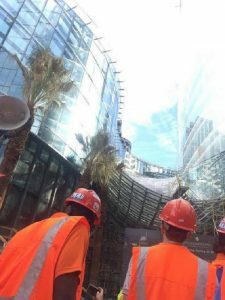 As the General Contractor on the project, Turner Construction was responsible for vetting and assembling a team of capable subcontractors to complete packages as large as $53 million for mechanical, $54 million for electrical, $26 million for plumbing and $8 million for fire protection! A couple of unique tactics were employed to provide facilitation of the project to meet the hard end date of the Wilshire Grand Hotel opening. These included extensive use of BIM modeling, phased permitting, design-build and delayed approval. 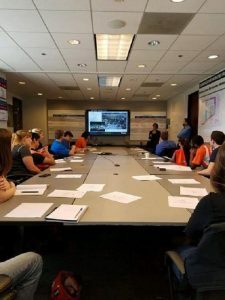 The presenters, Bianca Diaz (Senior Project Engineer) and Alex Montoya (Engineer) stressed the importance of BIM modeling and design strategies in allowing for innovation such as performing the largest continuous concrete pour ever. 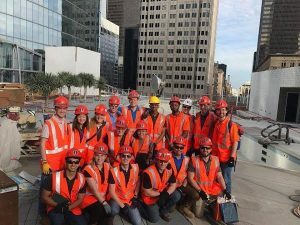 Turner Construction received a good amount of media attention for breaking this Guiness world record, which turned out to be a total of 21,200 cubic yards of concrete poured for the mat slab. Unfortunately, we were unable to visibly see this unparalled feat, as the foundation was long covered by stories and stories of the building! But how cool it was to be able to ride up to the seventieth floor (the floor of the future lobby) and even higher (to the skybar)! We were also shown the site of the future pool and entrance level. 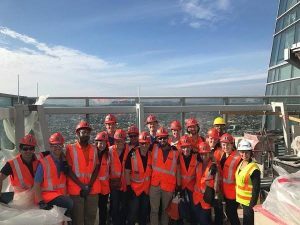 All in all, we were thoroughly impressed by Turner’s dedication to safety protocol, while maintaining schedule and budget. The building itself was beyond impressive, inside and out, and definitely aimed to go against the grain of the flat Los Angeles skyline. We were told that all the buildings in the downtown area were flat because there was an old city ordinance which required a helipad on every high rise in the area. The architects of the Wilshire Grand Hotel were able to compromise by suggesting an alternate approach instead, called hovering. So, the curved crown and jutting spire of the Wilshire Grand Hotel was given the go ahead. It is soon to be a new trademark of the Los Angeles skyline! If you have time, definitely take a look. Unique: 3000T water cooled system, thermal enegy storage tank, seismic monitoring system, methane mitigation system, temporary standpipe system, broke a world record!